Matamoros, Tamaulipas is a city along the Mexico-USA border. 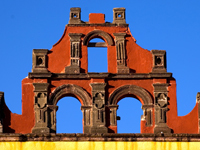 Located in the Mexico state of Tamaulipas, Matamoros is across from the U.S. city of Brownsville, Texas. The Matamoros Phone Book contains both Yellow Pages and White Pages. This telephone directory also includes several surrounding cities. friends and businesses in Matamoros with Mexico Yellow Pages and Whites Pages.